Thanks to a TTS email about their up to 80% off sale, Penny found herself ordering a few things on Tuesday during the children’s nap time – and spending far more than she intended to! One of these items was a Sparkle Den – same as the Dark Den but of course with a sparkle cover. Much to Penny’s surprise the Sparkle Den (and a wooden puzzle and a book about Ladybirds) was delivered today. Of course Penny and the children were very excited to receive a parcel and they had to open it at once. So Penny opened the parcel – which by the way the children described as very long and very heavy – and Penny took out the sparkle den and emptied the contents onto the sofa, We all looked at the component parts and tried to work out what to do with the (in the children’s words) the long sticks and the corner bits. Mia and Chinzia found the instructions – look at words said Chinzia – and the pictures said Mia. 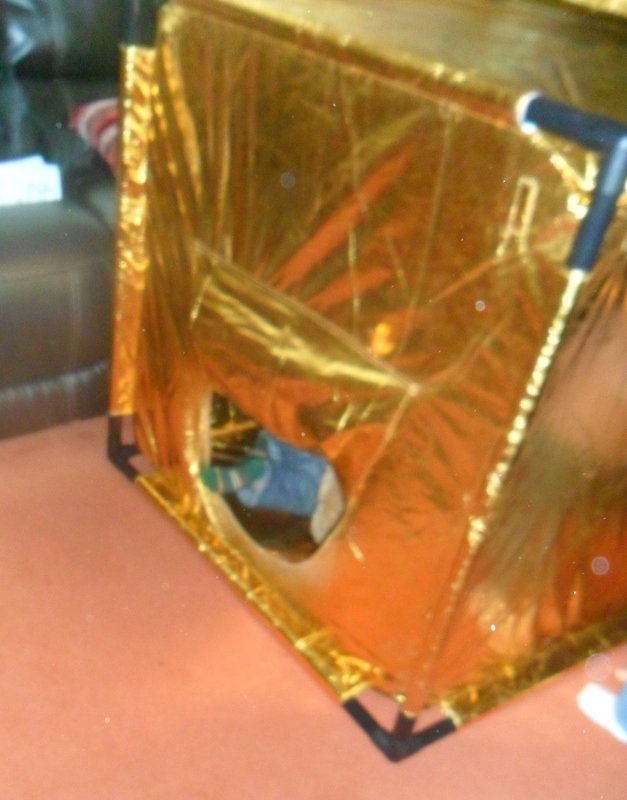 So we did together – and then began our joint effort to put the sparkle den together. It took a while and it took teamwork but finally we had the Sparkle Den ready for use. Do we still need the Bear Cave? asked Penny – pointing to the disguised Tweenies house. ‘No’ said the children ‘We have a new bear cave’ (Penny smiled to herself – as that is what she hoped they would say). So Penny took down the Tweenie house bear cave – and the children moved the bears into the new sparkle bear cave. Play then continued – mainly in the bear cave – but of course some walking (ok being honest some running with reminders from Penny about walking in the house) as they reenacted the story. 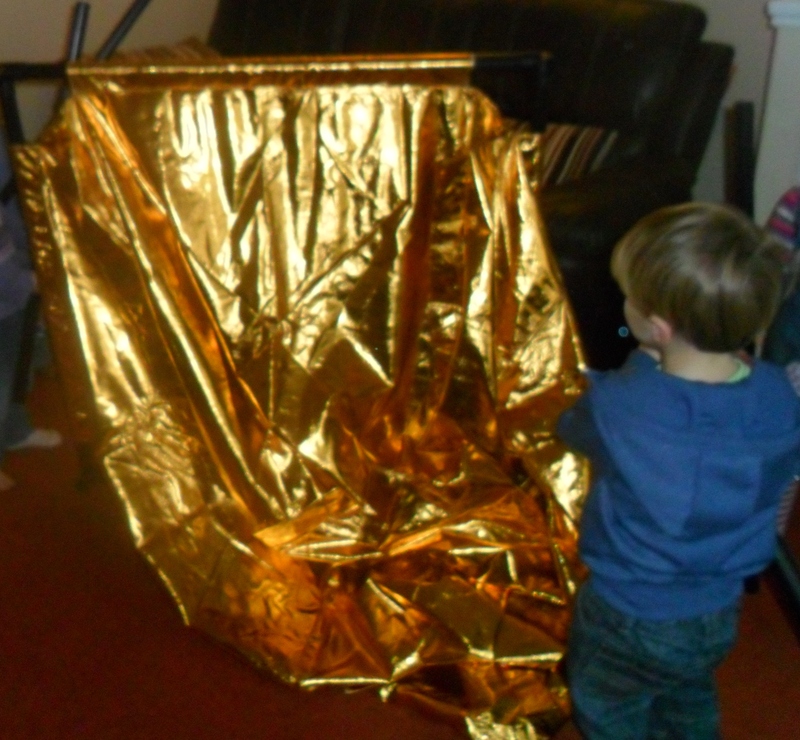 At lunch time Penny had a bit of a problem – Where to the sparkle den at nap time? Penny decided that on top of the coffee table would have to do – as would not fit through the door to go into the middle room and all the floor space was needed for the ready beds. Later in the afternoon Penny decided to add some light up resources – balls that you squeeze and they light up, battery operated toys that lit up – and spun round and round. The children loved them – and for the first time that day – there was peace and quiet as all the children sat in the sparkle den watching / playing with the light up toys. Sounds very much like our experience of the dark den 🙂 I also purchased the uv lighting kit and it is brilliant 🙂 out little ones spent ages getting the toys to see which ones glowed I the dark. And when they did they all squealed.. Very much a fun morning. Oh dear Sue – now I feel responsible for your bank balance as well – however I don’t feel guilty as I know the children will love it. My friend Carol has the Dark Den – and to save as both having both dens – we have agreed to swap covers for the dens every so often.